What is Flow? Why is it important in the creative arts and how do I find it? As artists there are times when we feel blocked, stuck and frustrated with our lack of artistic output and there are other times when we are riding the great artistic flow, living in the optimal experience of hitting our artistic goals and producing art on a regular basis. By better understanding our own creative flow, we can diagnose where the kinks in our creative life are so that we can get back on track. Not only is it important to look at how we can facilitate artistic flow, but also how we can create flow in our everyday lives. One thing that has helped me keep centered and be better able to be in flow artistically is to exercise regularly, take a long walk in the outdoors, spend time at the gym, or go for a swim; these do wonders for me. Visiting with friends & family, listening to music and reading also put me in a good state of mind. As does a great glass of red wine. Being in flow contributes to overall happiness. Mihaly states “Happiness is not something that happens. It is not the result of good fortune or random chance. It is not something that money can buy or power command. It does not depend on outside events, but, rather, on how we interpret them. Happiness, in fact, is a condition that must be prepared for, cultivated, and defended privately by each person.” I believe that you can find opportunities to cultivate happiness in your everyday life. You don’t have to wait for an annual vacation or special event. Any day you can go to your favorite restaurant, visit a friend, walk on the beach or do your favorite activity. These outside activities will help you achieve your artistic flow more easily. The following are six characteristics based upon the leading research of Mihaly Csikszentmihalyi’s book “Flow: The Psychology of Optimal Experience” that are present when we are operating in flow. I believe flow is a very important component in the visual arts. The paintings I have painted while I was experiencing flow are by far better than the ones that I have tried to push (or force my way) through. These are the paintings that seem to fall off my brush and are readily noticed by art lovers, collectors, friends and my fellow artists. They are also the paintings that get usually get accepted into national shows or have won awards. Flow is the state I am always aiming for. When I compete in a plein air event, the elements of flow are usually present for me. I am intensely focused, I am challenged by the changing light, time constraints and fellow competitors, time flies by and I find the experience very rewarding. Because you are in a competition the feedback on your efforts is immediate, you can judge your efforts based on your own goals, by viewing other artist’s work and sometimes by the award results. 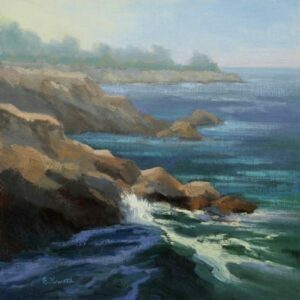 This painting “Out on the Edge”, 12×12 was created at the Mendocino Open Paint Out this past September. I remember painting on the side of the cliff and just experiencing the wonderful weather, the crash of the waves hitting the cliffs and the strong light and shadow pattern in the water. This painting was later accepted into the California Art Club’s “A Journey Through Central California” exhibition. Being in a competition and painting alongside many artists created a flow experience for me. I know that I also need my quiet time as a painter and time to study on my own. I was recently an Artist in Residence up in Mendocino. Unfortunately, the month that I was there, the weather forecasts were for wind and rain. Not conducive to plein air painting! So, I brought up several books on painting ocean waves. I had a choice to study or complain. I chose to study. 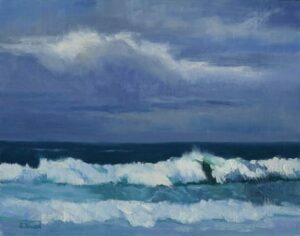 One of the books I read was E. John Robinson’s “The Seascape Painters Problem book.” I read about the form of the wave, how to set up a stronger composition and how the light in the sky relates to the ocean. There were a couple days where I was able to get great photos. One such day was at Mendocino Botanical Gardens one day; where I saw incredible waves and gorgeous cloud formations. This painting “The Onslaught” , 11×14 was painted from a photo I took, but also from my experience on location and from the information I learned in Robinson’s book. Later, I learned, Robinson lived in Mendocino for a time and had a mural at St. Anthony’s Church there. It was great for me to see his work in person. The Director of Marketing at the Mendocino Art Center was also Robinson’s son in law. We had a great conversation about his work and his life as an artist-there are no coincidences. I felt this experience put me in Flow; focused effort, mastery over my understanding of the area and painting technique, rewarding experience and completing my goals. I feel that the connection to Robinson’s work and the area was my immediate feedback. The third component of Flow for me is engaging in activities with other artists. I really enjoy, listening to artist talks, seeing demos, viewing another person’s artwork and painting with them. These activities all produce flow for me. Studies done by St. Bonaventure University found that students rated flow to be more enjoyable when in a team rather than when they were alone. 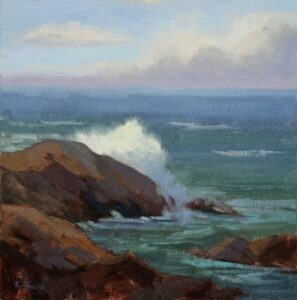 Last month, Jeff Sewell came to San Francisco to do a demo on painting oceans for the San Francisco Chapter of the California Art Club. Jeff did his demo to a packed house and it was great to learn about his approach to painting seascapes. Jeff focused on composition and creating form in the wave. Jeff invited everyone who attended the demo to join us in Pescadero for an impromptu paint out. For me, not only did I learn from the demo, but I learned from the other attendees. On Sunday, things just aligned for me to experience flow, we had great weather, a wonderful group of supportive & enthusiastic artists. There was lots of camaraderie among them. I chose to stand on my own on one of the cliffs, but I could see everyone from my vantage point. I felt calm, focus and very contented. We all established a great creative atmosphere. 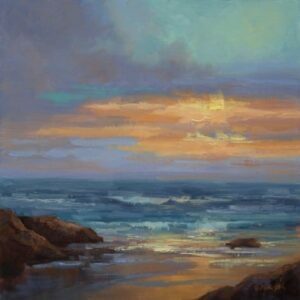 I painted “The Surge”, 12×12 that day in Pescadero and was happy with the result.